So “stretch pants” may not be an exciting phrase nowadays, but when the photos at left were taken, spandex had only recently come on to the market. Joe Shivers, a chemist at DuPont, invented “Fiber K” in 1958. Fiber K was the first spandex (an anagram of “expands”) and quickly became a replacement for nylon and rubber fabrics due to its capability to expand dramatically while retaining the ability to return to its original size. The women at left are demonstrating the stretching capabilities of clothing made in the new spandex fabrics after creating them in Jane Saddler’s class in the Iowa State University Department of Textiles and Clothing (now the Apparel, Merchandising, and Design programs). Make sure you click on the picture to see the students creating their pants. Learn more about textiles and clothing courses, as well as textiles research, in the RS 12/10 collections. David Grant Caplan. “History of Stretch Fabrics: Pulling at Stretch Fibers’ Roots.” WWD 181, no. 117 (Jun 12, 2001): 10. http://search.proquest.com/docview/1434218348?accountid=10906. March is here, and so are spring clothing lines! As Apparel, Merchandising, and Design majors get ready for The Fashion Show next month, let’s take a look at an earlier ISU fashion moment. Three women students work in a Textiles and Clothing classroom circa 1940. RS 12/10. Here are three students in a 1940s Textiles and Clothing classroom working on a dress design. Two students drape and cut fabric on a small mannequin, while a third works at a drawing board. Textiles and Clothing has a long history at ISU. Sewing classes were first introduced in 1879 as part of the Domestic Economy curriculum. In 1924, the Department of Textiles and Clothing was established. In 2001, the department was combined with the departments of Family and Consumer Science Education and Studies, and Hotel, Restaurant and Institution Management to form the Department of Apparel, Education Studies, and Hospitality Management. The Fashion Show grew out of the annual style show presented by the Textiles and Clothing Club during VEISHEA. We have a number of resources for the (historical) fashionista! More photographs of Textiles and Clothing students can be found in the photo set on our Flickr page. We have many collections related to the Department of Textiles and Clothing (RS 12/10) in the College of Family and Consumer Sciences. 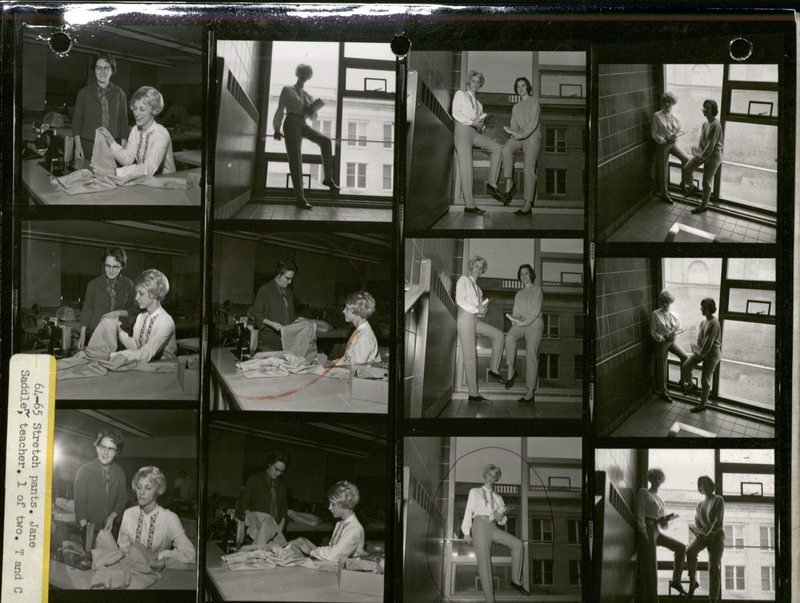 Also, check out the finding aid for the Textiles and Clothing Fashion Show Records (RS 29/2/4). And be sure to take a look at the fascinating Fashion Plates Digital Collection.